Home » News archive » DRAGONLORD:…n." DRAGONLORD: To Premier "Ominous Premonition." Renowned Testament guitarist Eric Peterson recently announced the release of his highly-anticipated new DRAGONLORD album, entitled Dominion, out next Friday, September 21, 2018 via Spinefarm Records. The symphonic black/death metal album serves as the long-awaited follow-up to 2005's Black Wings of Destiny, but takes the fantasy and storytelling to a whole new level. Dominion explores themes of darkness owning and influencing these times we now live in, and things that have come to pass. It also delves into other eras, real and otherworldly. 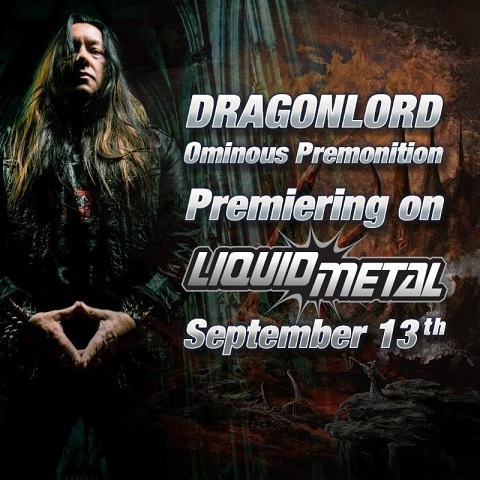 Tomorrow morning at 7:00 AM ET, SiriusXM Liquid Metal will air the new DRAGONLORD track, "Ominous Premonition". The track will continue to air throughout the day. Tune into SiriusXM Channel 40 to hear the track! Eric Peterson says, "This is the second track off the new DRAGONLORD LP/CD Dominion. This song from the first notes wreaks ominous sounds and foretells the premonition of wickedness… EVIL!!!" Watch the lyric video for the album's first single, "Dominion" here, and the fantasy-driven music video for "Northlanders" here. Dominion is a dark fantasy fan's musical dream - exploring everything from Nordic history to Lord of the Rings! Dominion's eight songs create a deep and heady musical journey rife with meaning and menace, from the blackest and loudest recesses of Eric Peterson's mind. Peterson recorded Dominion at Northern California's Trident Studios and produced it with an assist from engineer/mixer Juan Urteaga (Testament, Machine Head, M.O.D.). Dominion was mastered by famed producer/engineer Jens Bogren of Fascination Street Studios in Sweden. In addition to Eric Peterson, Dominion features the musical talents of Lyle Livingston (Psypheria) on orchestrated keys and pianos, Alex Bent (Trivium) on drums, and notable fantasy metal singer Leah on female vocals and choirs (who has performed/recorded with members of Blind Guardian, Nightwish, Delain and others).